The parliament has granted powers to the tourism ministry to authorise developments on resorts in a move critics say will weaken the environment protection regime, and pave the way for corruption. Amendments to the tourism law passed today transfers to the tourism ministry the Environment Protection Agency’s (EPA) powers to evaluate environmental impact assessments (EIAs) and authorise projects such as land reclamation. The agency functions as an independent body under the environment ministry. Voting on the bill submitted by government-aligned MP Mohamed Ismail took place amid continuing protests by opposition Maldivian Democratic Party (MDP) MPs. It was passed with 41 votes in favour after Speaker Abdulla Maseeh Mohamed asked for a show of hands. If the amendments are ratified, resorts will have to seek authorisation from the tourism ministry for any development that could “permanently alter” the island, plot of land, or lagoon’s environment. The ministry must evaluate an EIA report before issuing permission. EPA permanent secretary Ajwad Musthafa told the economic affairs committee during its review of the legislation last week that “the independent checks and balances system will be lost” if the regulatory powers are transferred to the tourism ministry. The move amounts to allowing the tourism ministry to “self-regulate,” he contended. The EIA process is the “main instrument” of the environment protection regime and adheres to international best practices, he said, noting that the reports are prepared by independent and qualified consultants. Ajwad also objected to transferring technical experts to the tourism ministry as the agency’s “institutional capacity” was built up over a long period. EPA director Miruza Mohamed meanwhile warned that the move could reduce funding from international donors. The involvement of other ministries and institutions in regulating resorts hinders the tourism ministry and “lowers investor confidence”. The new provisions state that “only the tourism ministry will have the authority” to conduct assessments and authorise development projects. Environmental NGO Ecocare warned that the move conflicts with the environment protection law – which requires the EPA to evaluate assessments – and could “pave the way for corruption”. “Under this particular scenario we also feel that when EPA assess and evaluates EIA reports, it is a more transparent practice than leaving this to the Tourism Ministry, who carry out the evaluation and awarding of bids for tourist resorts,” Ecocare said in a press release today. The current system put in place by the Environment Protection and Preservation Act includes checks and balances and assures transparency and accountability, Maeed Mohamed Zahir from Ecocare told Minivan News today. With the changes to the law, an unscrupulous official at the tourism ministry can grant approval “regardless of the effect on the environment,” he said. Opposition Maldivian Democratic Party (MDP) MP Fayyaz Ismail said at the committee last week that the tourism ministry presently “discriminates” in issuing and suspending operating licenses to resorts. Fayyaz warned that officials could misuse the authority to approve development projects on resorts and selectively impose fines at whim. MP Ali Fazad, a ruling Progressive Party of Maldives MP, also expressed concern with the amendments conflicting with the existing environment law as “two laws would have two [provisions] for the same thing”. However, all ruling coalition MPs on the committee voted in favour of the bill and forwarded it to the parliament floor. The law also introduces a new scheme to allow the extension of resort leases to 99 years for a lump sum payment of US$5 million. The changes aim to incentivise investors, make it easier to obtain financing from international institutions, and increase revenue for the government. President Abdulla Yameen has announced plans to develop five resorts in the northern Haa Dhaalu Atoll next year. Yameen said that the first islands to be developed as resorts by the current government will be located in Dhipparufushi, Vaikarumuraadhoo, Kanamana, Kudafaru, and Keylakunu islands in the country’s second-northernmost atoll. During his visit to the northen atolls, President Yameen also talked about the government’s plans to develop an airport on Kulhudhuhfushi to further encourage the arrival of tourists. Officials from the government promised the even distribution of resorts earlier this year following an online petition calling for the area to participate in the benefits of the country’s billion dollar tourism industry. Haa Dhaalu is currently the only atoll in the country without any operating resorts. President’s Office Spokesperson Ibrahim Muaz told Minivan News of the strategic importance of Kulhudhuhfushi Island, which has a population of around ten thousand people. “Projects like the proposed airport, resort development, and the I-Havan mega project will bring with it prosperous employment opportunities for the people residing the northern atolls, eliminating need of migrating to the capital Malé for employment,” said Muaz. Muaz also noted that such projects, while providing numerous employment opportunities, would also develop the infrastructure in the region and improve the general living conditions in the North. The UNDP’s most recent Human Development Report noted that disparities between the central and outer atolls were causing losses to human development, with the northern atolls reporting to suffer the most from limited job opportunities and social services. This year’s Avaaz petition – signed by just over 500 people – noted that the economic and societal problems of the 20,000 inhabitants of the atoll could be alleviated by the development of resorts. The petition argued that the development of the region’s “pristine uninhabited islands” would halt the “mass migration” to Malé which was “tearing up the social fabric of our society”. President Yameen’s election campaign pledged to develop 50 operational resorts during the five year presidential term. Yesterday’s proposed 2015 budget also planned for tourism growth, with 10 new resorts proposed in a MVR24.3 billion budget plan. Despite the total number of resorts in the country exceeding one hundred, the majority are clustered around Malé and the country’s main international airport. After initial plans for the 40-year-old industry’s development envisioned regional hubs, the introduction of sea planes has encouraged the concentration of resorts in the now-crowded central atolls. The government’s plans for regional development have centered around the controversial SEZ bill, which it argues will decentralise development in order to promote regional growth – though the bill’s detractors fear that the policy will come at the expense of political decentralisation. Relaxed regulations in the SEZs are intended to attract investors for a number of ‘mega projects’, including the iHavan – or ‘Ihavandhippolhu Integrated Development Project’ – in Haa Alif Atoll. The project aims to take advantage of the strategic location of the Maldives’ northernmost atoll on a major shipping route – through which more than 700,000 ships carry goods worth US$18 trillion a year – and develop 5,700 hectares of land along with deep natural harbours. Meanwhile, environmental NGO Ecocare has protested against the proposed Kulhudhuhfushi airport, pointing out that the airport’s development would destroy a mangrove area which would be reclaimed in order to build the airport. Ecocare suggested a speedy ferry transportation system to Hanimaadhoo Airport which is just 16.6 km away after labelling the Kulhudhuhfushi airport as “economically less viable”. The Tourism Ministry has assured that the development of resorts will take place throughout the atolls following an online petition calling for tourism growth in Haa Dhaalu. Placed on the Avaaz website last week, the petition calls upon the government of President Abdulla Yameen to alleviate the atoll’s economic and social problems by bringing resorts to the area. “It has been over 40 years since the tourism industry flourished in Maldives. However, the atoll with approximately 20,000 people has not yet got the opportunity to enjoy the economic benefits of this sector,” read the petition. Noting that Haa Dhaalu is the only atoll not to have any operational resorts, the petition argues that development of the region’s “pristine uninhabited islands” would halt the “mass migration” to the capital Malé, which was “tearing up the social fabric of our society”. “We have waited long enough to enjoy the success and development that tourism industry has brought to other regions of the Maldives,” the petition argues. The Maldivian economy is heavily dependent on tourism, accounting for an estimated 80 percent of GDP, generating 38 percent of government revenue in 2012. Tourists arrivals grew by 17 percent between 2012 and 2013. In response to the petition, State Minister for Tourism Ahmed Musthafa Mohamed told Minivan News today that the government’s promises to develop ten resorts a year would include Haa Dhaalu. Musthafa noted that a lot of issues affected the location of developments, with the issue of transportation in Haa Dhaalu – part of the country’s northernmost natural atoll, Thiladhunmathi – having been a longstanding one. Thought the Maldives is now home to over one hundred island resorts spread across 26 natural atolls, the majority of resorts are clustered around the country’s capital Malé and the country’s main international airport. Despite the opening of Hanimaadhoo International Airport in Haa Dhaalu atoll two years ago, the continued lack of economic activity has led to significant local support for a second regional airport in nearby Kulhudhuffushi. While the new development threatens to destroy much of the island’s mangrove habitat, recently re-elected island MP Abdul Ghafoor Moosa has previously argued that his constituents’ economic concerns outweighed the environmental. The Avaaz petition – which has received over 460 signatures – argues that, despite its relatively high population of 20,000 people, the atoll had gone “unnoticed or perhaps unheard” by consecutive governments. The petition goes on to suggest that the limited local opportunities in the civil service, fisheries, and agriculture had failed to provide enough employment opportunities. 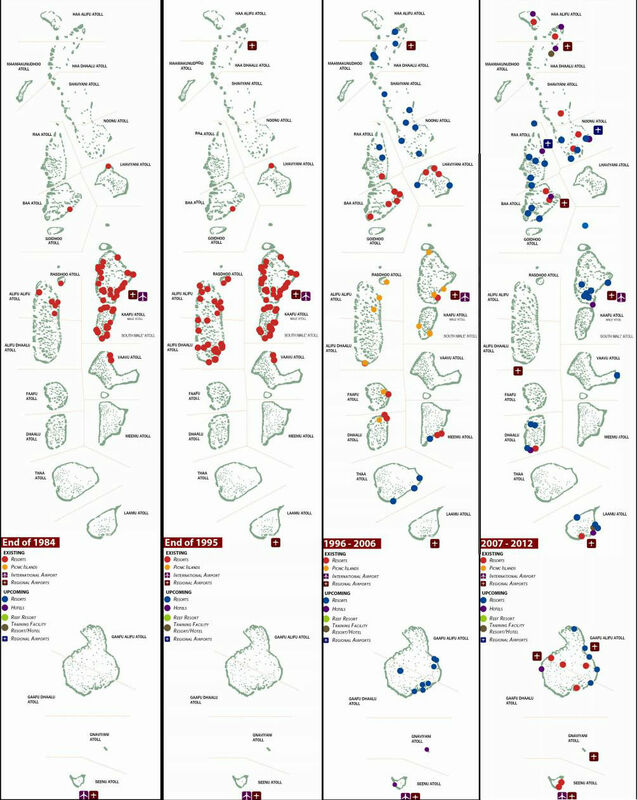 The 2013 Tourism Yearbook produced by the Tourism Ministry shows that three resorts are currently under development in the atoll, although only one had been given an estimated opening date – for December this year. Reasons for the failure to develop secondary tourism hubs in the north and south of the were addressed in the ministry’s ‘Fourth Tourism Master Plan – 2013-2017’. The document explained that historical growth patterns in the tourism industry had centred on the Malé area after private investors sought greater economies of scale. The introduction of sea planes – expanding the area serviceable from Ibrahim Nasir International Airport – had further delayed regional expansion. “If, as the last two masterplans strongly suggested, the suitable islands around the Malé’s hub are now more or less fully developed, the time has come to give priority to the secondary hubs,” read the document. The People’s Majlis’ failure to extend the country’s tourism bed tax before recess will result in losses of MVR100 million a month, the Finance Minister is reported to have told local media. As of the start of 2014, the tourism bed tax taken under the Maldives Tourism Act of 1999 will be discontinued because of a deadline added to the act during its second amendment in 2010. Article 35 – D of the amended act states that within three years of taking TGST (Tourism General Services Tax), the US$8 tourism bed tax per person per night shall be discontinued. As the TGST was introduced with the year 2011, the current deadline came to pass at 12am this morning. Quoting the Deputy Commissioner General of Maldives Inland Revenue Authority (MIRA) Hassan Zareer ‘Haveeru‘ has reported that this will result in a reduction of MVR1 billion – or ten percent of annual state revenue. He said the issue had been brought to the government’s attention. Minister of Finance Abdulla Jihad was quoted as saying that this change would incur a loss of approximately MVR100 million per month from the state cash flow. On 9 December 2013 MP Abdul Aziz Jamal Abubakr, proposed an amendment to the act – on behalf of the government – extending the deadline for another year. However, it was not passed when the Majlis went to recess with the final sitting of the third session on 30 December 2013. The next session of the Majlis will begin on 1 March 2014. MIRA statistics reveal that from January – November 2013 the tourism tax accounted for 9.6% (MVR787,340,577) of the total revenue collected by the authority. Within the same period tourism land rents contributed 9.8%, and TGST 27.3% of the total revenue. On 29 December the Majlis passed a MVR17.95 billion (US$1.16 billion) national budget, despite concerns from the public and various organisations. The central bank Maldives Monetary Authority (MMA) warned that if proposed revenue raising measures in it were not implemented, the budget could not cater for even the recurrent expenditure. The authority anticipates that the resulting budget deficit for 2014 could potentially increase from MVR886.6 million to 4.4 billion (11% of GDP). The International Monetary Fund (IMF) also proposed the implementation of a number of measures to raise revenue and reduce spending. Dhivehi Rayithunge Party (DRP) MP Dr Abdulla Mausoom has been appointed General Manager of Sun Island Resort and Spa, a resort owned by Jumhoree Party Leader Gasim Ibrahim. Gasim’s party allied with the Progressive Party of the Maldives (PPM) which won the recent election. “Tourism has always been very close at heart. I’ve taken over as the resort’s General Manager yesterday,” Dr Mausoom said, according to Sun Online. The resort’s previous manager, Mohamed Saeed, was last week appointed Minister of Economic Development. Correction: An earlier version of this article incorrectly stated that Sun Island is owned by Ahmed ‘Sun’ Shiyam. Minivan News regrets the error. The decline in tourism arrivals from the Maldives’ traditional European markets is a result of the state’s failure to adequately promote the destination, resort tycoon and Maldives Development Alliance (MDA) leader MP Ahmed ‘Sun’ Shiyam has declared. The MDA allied with the Progressive Party of the Maldives (PPM) for the recent election, in which PPM candidate Abdulla Yameen was declared President. “Tourist arrivals from European markets have gone down more than ever before. Maldivians are not able to enjoy the real benefits, because of negligence in promoting tourism,” Shiyam alleged in local media. 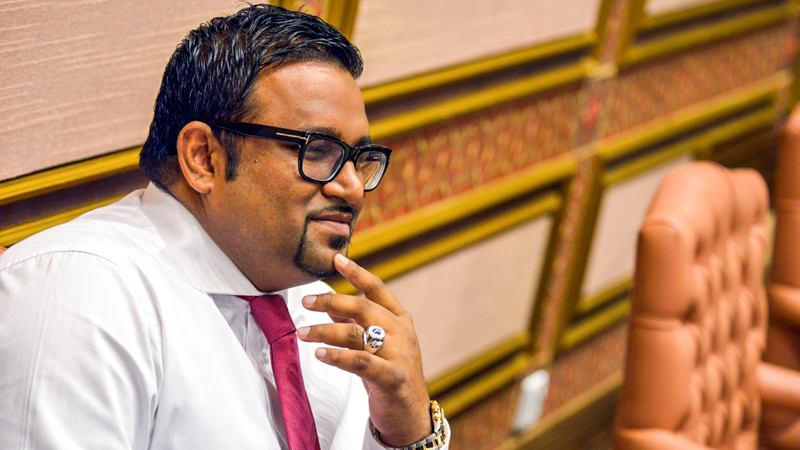 Tourism marketing is overseen by the Maldives Marketing and PR Corporation (MMPRC) and Tourism Ministry, the minister of which, Ahmed Adheeb, was last week reappointed to the same post in Yameen’s government. The MMPRC’s former head, Mohamed Maleeh Jamal, was appointed Minister of Youth and Sports. Shiyam warned of a deteriorating economic situation that could leave the government no other option than cost cutting. According to a recent report by the Finance Ministry, tourism growth flat-lined in 2012 as a result of two years of political turmoil. The tourism industry’s Gross Domestic Product (GDP) growth in 2012 declined by 0.1 percent following 15.8 percent growth in 2010 and 9.2 percent in 2011, the Finance Ministry revealed in a “Fiscal and Economic Outlook: 2012 to 2016″ statement included in the 2014 budget (Dhivehi) submitted to parliament. “The main reason for this was the political turmoil the country faced in February 2012 and the decline in the number of days tourists spent in the country,” the report explained. Tourism growth is measured in bed nights, as arrival figures – predicted to top one million in 2013 – do not necessarily give a clear picture of the industry’s performance. “As the most number of tourists to the country now come from China, we note that the low number of nights on average that a Chinese tourist spends in the Maldives has an adverse effect on the tourism sector’s GDP,” noted the Finance Ministry’s report. The Maldivian economy is largely dependent on tourism, which accounted for 28 percent of GDP on average in the past five years, and generated 38 percent of government revenue in 2012. Indirectly the industry is thought to contribute up to 70 percent of GDP, and 90 percent of all foreign exchange. Much of that revenue is generated through the tourism GST, introduced during the Nasheed government amid resistance from many of the country’s resort tycoons. It is currently set at 8 percent, however the new government has warned it may increase it to 12 percent in an attempt to match its high levels of expenditure. “Rich Chinese who are sick of crowds at home during major holidays have discovered the Maldives, the tropical islands that typically draw jet-setters from Europe looking for an exotic locale,” writes Wei Gu for ‘The Wall Street Journal’. “The Maldives has become the most desired destination for the Chinese, according to a report from China’s Tourism Bureau. Chinese tourists now dominate travel to the island country, with 103,734 arrivals in the first seven months of 2013, up 66 percent from the same period in 2011, according to its Ministry of Tourism Arts and Culture. Chinese visitor numbers dwarf those from the UK and Italy, which are in second and third place with 60,021 and 53,493 tourists, respectively. During the recent Golden Week holiday, Zhu Hong, a partner in fashion boutique Shanghai Tang, joined with a group of eight business acquaintances for a private-jet trip to the Indian Ocean islands. The luxury-goods executive is now on his seventh passport after running out of pages on the previous six. Most of his friends, who are Shanghai property developers, haven’t spent as much time abroad, so they were eager to tag along with a well-travelled English speaker. Unlike many Chinese who often travel with business associates, Mr Zhu normally prefers to spend holidays with his family, but made an exception because his son was training for a tennis tournament. They stayed in villas on the water in the Maldives, but hardly dipped their toes in the water. They spent most of their time playing a popular Chinese card game called fighting the landlord. ‘Although I wished they have spent a bit more time on the beach, they really saw this game as an engaging intellectual challenge,’ Mr. Zhu said. Well-off Chinese who are tired of beaches in Southeast Asia are looking for a new destination.